← Human Breast Milk Donations… Sounds Gross, But Is It Really? For a few months, I was taking Goldie to the loo over the sink in our bathroom. It was a really great set up. She would go, I would wash it down the drain, wash her bottom off and then pat her dry with a towel. Finished. I didn’t have to use any wipes and thus avoided having to throw anything away and she was really clean afterwards. SCORE! But… it doesn’t take more than a few bites of solid food to turn benign liquid breastfed baby poo into something a bit more ‘solid’. You really start to notice the change right away. Margo took this photo… a little photog in the making. I tried her on the potty a few times, but she wasn’t crazy about it. We do have a potty in the car that she uses were out and about. But, at home, she was very much used to me holding her over the sink. I also tried her on the toilet, with me sitting behind her, but every time she would sit there, Margo would come and want to have a chat and Goldie would get distracted and try to blast her way off the toilet by arching her back in protest. 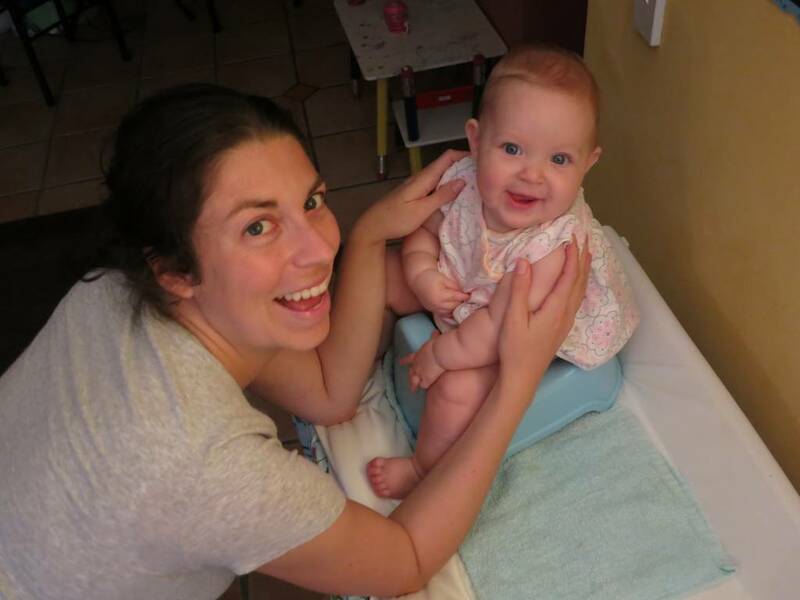 We started Margo on the potty when she was only 2 months old, so by the time she was ready to start solids, she was very used to sitting on it. But, for some reason, I never really used the potty with Goldie, just the sink. I think because of the wash and dry factor, just made it easier. Luckily, babies at this ages are very adaptable to changes. Although I knew it may take a few days for her to get used to the potty, I knew it would only be a short matter of time before she was doing it. 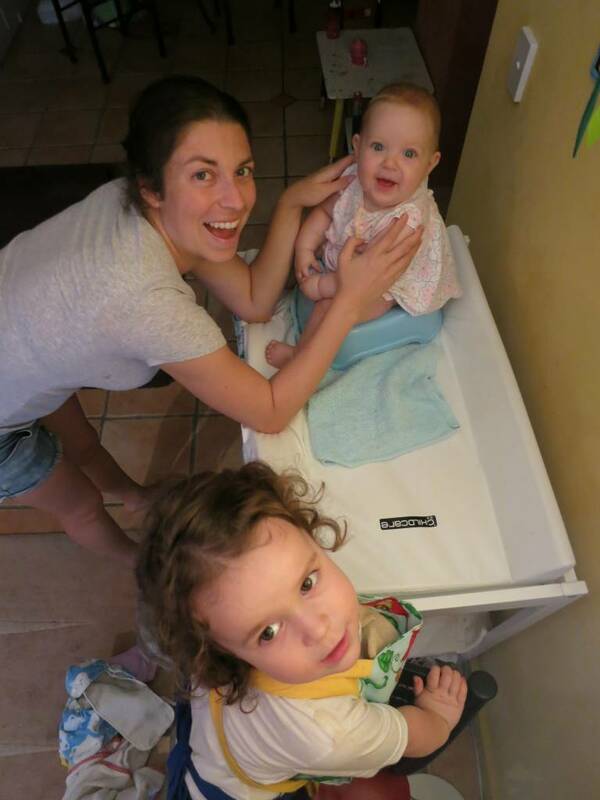 I did have to take her to the sink still a few times… even with the more solid poos… eww… But, I knew that she had to go, and she kept arching her back saying ‘NO’ when I tried to take her other places. This time, the sink poos, I didn’t wash down the drain, there was no way. I had to sacrifice a flat terry cloth diaper to wipe it up and then just spray it off in the toilet with out toilet sprayer thing. 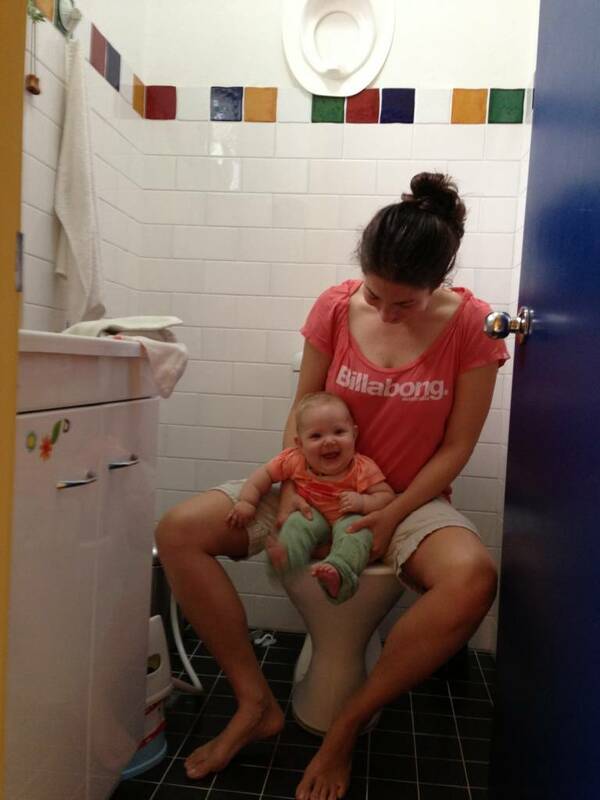 Oh well… it was only a few times, and I would way rather have done that than have her go in a diaper. So, anyway, we’ve got it all sorted now. Goldie’s using the potty and she gives out a huge squeal of delight when I put her on it and she really has to go. Margo climbs up on a chair next to the table to cheer her on. I still take Goldie to the sink at night, it’s easier that way, and she doesn’t do any poos at night. I better hit the sack, Goldie has been wanting to wake up at 5am lately and roll around and play and use the potty a hundred times, all while my eyes can barely open and everyone else is snoring! I don’t really mind, she’s so cute and giggly in the morning, I love it! I love your EC posts! I wrote my first EC post scheduled for tomorrow. It’s been great with the newborn so far and really hoping it inspires big brother to go in the potty soon. I so wish someone told me about EC with my first-born! REALLY. So great to hear! I only knew about it because someone told me… Starting from birth is the best though! I’m amazed. Truly. I love the idea of EC, but I know it just wouldn’t work for my household right now. Kudos to you, though! I think I have stated this before but your blog was the first that introduced me to EC and I am glad to report that at 5 months we are EC-ing all the way. We started when he was ten days old. It is fun and we do have a blast. He actually sleeps through the nigh dry and wakes up to go to the potty in the morning. At first I tried to wake him up to take him to the potty but he would not go. So I just let him be. EC IS AMAZING!!! My Husband is even more thrilled about it then I and makes sure we never miss a pee or poo! We have turned into these EC fanatics. For some reason I do not blog about it much but in real life EVERY single time we are out I make sure to spread the word. I love to see the different reactions!!! We do have a blast and the greatest thing is that our son LOVES it when you take him to the potty. If he asked and I did not take him he cries and acts as if I wronged him. It is amazing how well he communicates!!! I think when you actually listen to your child they mature and develop quicker than if you don’t. And I do not think there is an excuse not to EC. It is so rewarding plus not poopy diapers. I can go on and on I’m so excited about it. I think I will go and write an ‘EC update’ post of my own. That is so super fantastic to hear! I feel the same way… I used to go around blabbing about EC, but then realized people didn’t really want to hear about it!? Of course a few people really liked the sound of it and it changed the way they parent! So glad you are one of those people! Happy ECing! So glad you visited my page and that I could in return see what you all are doing with EC! I love finding other bloggers who are doing this and what success they’ve seen 🙂 I’m also excited to see a little about how you’ve introduced solid foods, that’s our next adventure!